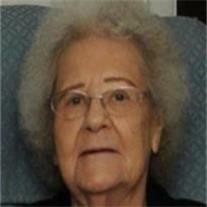 Evelyn Marie Henderson 95, born in Baggs, Wyoming on January 8, 1917, was called home Wednesday, October 24, 2012 in Mesa, AZ. She raised her family in Craig, CO. Following the death of her husband in 1962, she moved to Mesa, AZ, where she lived for the remainder of her life. She was preceded in death by her husband, David, sons Wayne & Ralph, 5 siblings, and grandson, Matthew. She is survived by sons Kenneth (Linda), Gerald (Joyce), daughter-in-law, Marlene, 27 grandchildren & 84 great-grandchildren. Evelyn was a loving mother, grandmother and great-grandmother who will be deeply missed. Funeral Services are Saturday, October 27, at the LDS Church, 1911 N. 24th St, Mesa. Viewing at 3:00 p.m. followed by services at 4:00 p.m. Interment in Craig, CO. Arrangements by Bunker’s Garden Chapel.